The Massachusetts Institute of Technology (MIT) has created a building system in which a swarm of robots spins fibreglass tubes to make a structure. The institute’s Mediated Matter Group developed these “fibrebots” to work together to build large-scale structures. It has tested the concept last autumn by using 16 to build a 4.5m-tall structure that was able to weather a Massachusetts winter. 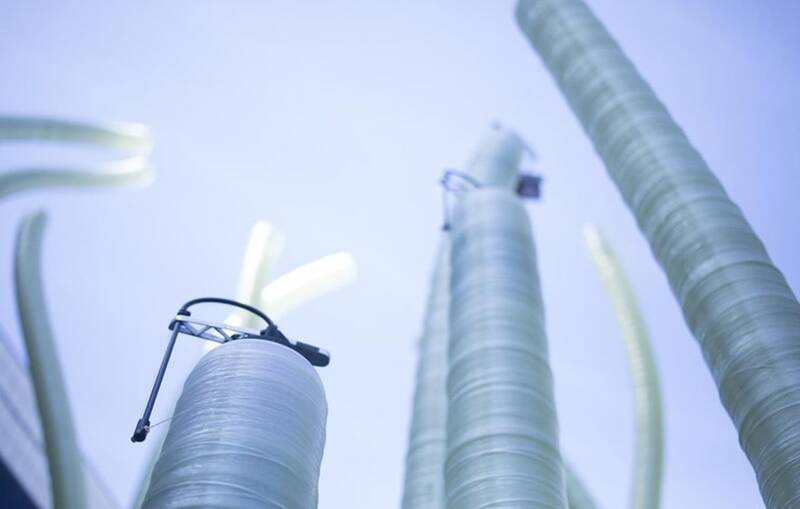 The fibrebots work by winding fiberglass filament around themselves, making tubular funnels that can be assembled in parallel, and interwoven to create structures. The bots are able to control the length and curvature of each tube to match an overall design. The technology allows an architect or engineer to control the general design parameters without providing commands for each bot. Mediated Matter Group says the project demonstrates “the potential of this enabling technology towards future collaborative robotic systems to create once infeasible designs in potentially far-reaching environments”. In future, the group want to extend its research “from the micro-scale to the product scale and, uniquely, to the architectural scale”.